How do natural disasters affect human well being, economically? When considering human well being ignoring economic factors when calculating how 'well' someone is would skew data significantly, which is why it has been chosen as the main quantitative factor in this inquiry. Families already in dire poverty and lacking in financial support from their government can be the people most economically affected when a natural disaster hits. Basic human needs such as clean water and food, hygiene and sanitation can be scarce for these families to begin with but when exposed to a disaster these people might not have the resources or money to provide this things for their family resulting in; illness, disease, malnutrition and possibly death. For poverty affected families passing the initial impact of a natural disaster is not all there is in the journey of survival. Businesses and homes can be destroyed and without long term shelter and an income source families are pushed further down into poverty and with reoccurring disasters these families will remain down and hinder the future for their children. For civilians caught in natural disasters who earn a medium celery per annum, the impact can be more serious to them then we might assume. Families who are uninsured or are relying on natural resources/agriculture/ fishing to gain income will often be pushed into poverty and forced to live in that cycle for years, also hindering their children's futures. Governments are one of the other groups heavily affected by a natural disaster. If the natural disaster has impacted the trade of the countries natural resources the whole country suffers, even more so every citizen who pays taxes to get roads and infrastructure repaired and national debts reduced. The Philippines is rated the 3rd most prone country to natural disasters and because of this the overall economy of their country is still relatively underdeveloped. Rebuilding and feeding money into repairing damages of a disaster is a common cycle for the Philippine government and because of this they do not have the money or resources to raise their own economy. Over the years 1980 to 2008, 363 separate disasters have occurred, killing 32, 956 people with many more people missing from any one of these events. 116, 212, 416 people have been affected directly by these disasters. 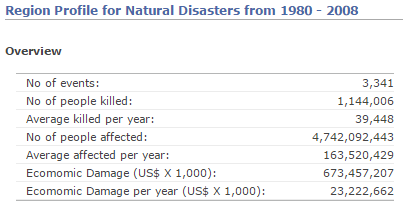 Economic damage for these 28 years adds up to 7, 417, 145 US$ X 1000 and annually $239 263 000 US$ for damage. 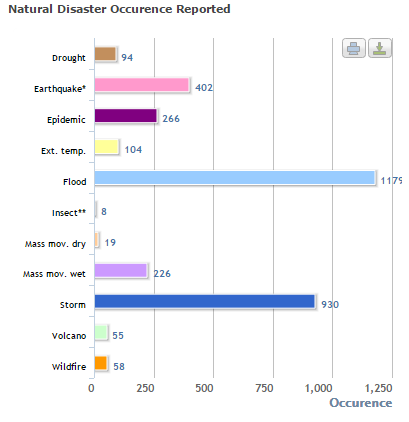 Between the years 1980 and 2008, 3 341 disasters occurred killing 1, 144, 006 people . Overall people affected however reaches over 4000 times as much as the death toll at 4, 742, 092, 443 people affected. Economic damage was phenomenally high for the 28 years recorded (1980-2008), 673 million US$ X 1000 was the total, that's an average of 23, 222, 662 million US$ X 1000. Communities and countries reliant on natural resources and agricultural farming are affected economically the most. 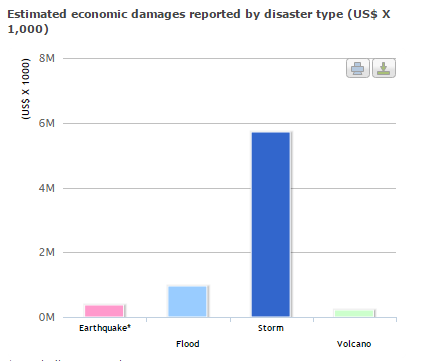 In the Graph entitled, ' Estimated economic damages reported by disaster type' we can see the drastic differences between the damage of each natural disaster and can conclude certain hypotheses revolving around it. Earthquakes and Floods have a constant rate of basic structural damage within the affected areas and therefore building and infrastructure are more damaged from the most basic level and involve more money to tear down and then reconstruct. Droughts and Wildfires occur less than earthquakes or floods furthermore the money spent to repair the damages is less long term.